**Note: the measurements given below are for 1:24 scale. 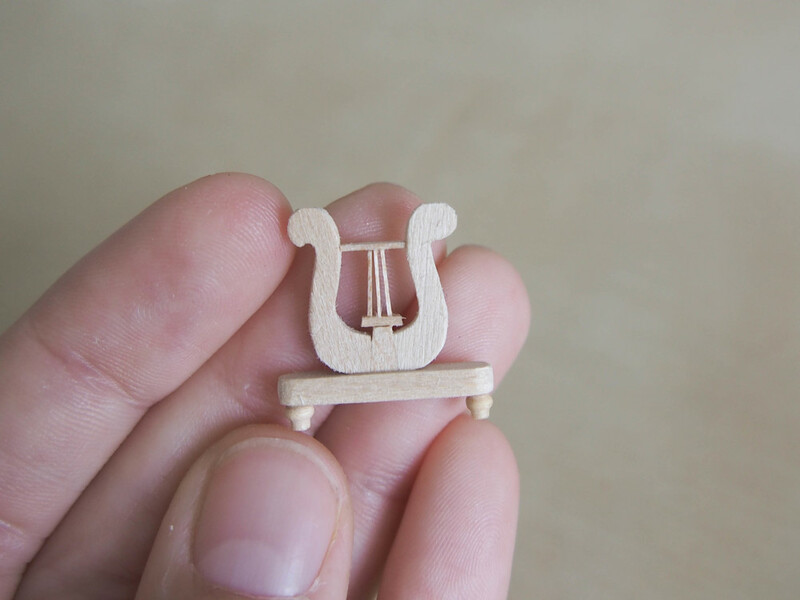 If you would like to make the lyre table in 1:12, double the measurements (including the wood thicknesses). 2 x drawer end pieces in 2mm thick wood ( 25mm x 6mm). 2. The front drawer of the table is a false drawer. To create the illusion, you will have to cut the drawer out of a different tone wood. As shown above right, cut out the section of the front drawer panel where you will be placing the drawer insert, leaving about 1.5mm on each side. Once this has been cut out, use the frame as a guide to cut out the insert piece. 3. Inset and glue the drawer panel into the cut out section as shown above left. 4. As shown above right, mitre and glue together the four drawer section pieces. Once you have done this, use the frame (pictured middle) as a guide to cut the base in 3mm thick wood. 5. Now you must cut the lyre leg pieces from 2mm thick card. For each of the two legs you must cut three pieces, the two lyre shapes and middle key stone As shown above left. To do this, first cut yourself a template from paper. At the widest point the lyre shape should be 13mm wide and 15mm from top to bottom. TIP: Cutting the lyre curves can be difficult, so it is best to cut only the crudest shape with your blade, and then sand in the fine curves. This will avoid the wood splitting. 6. Now cut and glue on the base foot bar for each table leg from 3mm wood. These bars should measure 20mm x 3mm. 7. This step is optional. You can cut and glue in the details of the lyre (three strings and cross bar) or leave the lyre plain. Both will look good. I cut the details from 1mm thick wood. 8. Cut the top bar from 2mm thick wood at 20mm in length. For a neat finish, bevel the edge of this top cross bar as shown above right. 9. To finish the table, cut a base cross bar in 2mm thick wood 38mm in length to span between the legs. You can turn this bar, or leave it plain as you wish. 10. Glue on the drawer knobs, and you are finished.